Devotion to the Sacred Heart of Jesus is a devotion that focuses attention on the physical Heart is the symbol of His redemptive love. Although tradition often situates the beginning of the practice of the devotion to the year 1000, it might be more accurate to place its birth during the time of the great mystics [St. Anselm and St. Bernard] between 1050 and 1150. By the middle ages, because of a strong emphasis on the Passion of our Lord, and because of the efforts of St. Bonaventure and St. Gertrude the Great, the devotion became popularized as a means of worshipping the mystery of Christ, living in the Church. This devotion was promoted by great Saints, including St. Albert the Great, St. Catherine of Siena, St. Francis de Sales, as well as the great religious orders, such as the Benedictines, the Dominicans, and the Carthusians. However, it must be recorded that the Saint who is most often associated with this devotion is St. Margaret Mary Alacoque [1647-1690]. After she received the Vision of the Sacred Heart, which popularized the devotion, she was scorned by her mother superior who thought her to be delusional. The Saint took ill. Mother superior told St. Margaret Mary that she would believe the miracle of the vision if the Saint were cured. 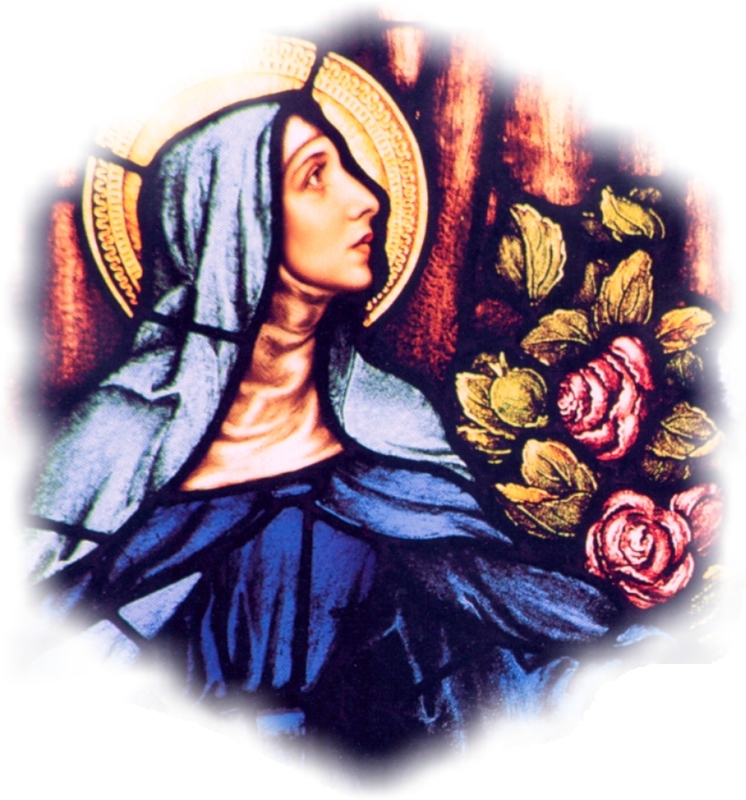 She was and St. Margaret was able to promote the devotion under the guidance of her spiritual director, St. Claude Colombiere. Several books have been published on her extensive letters, sayings and the revelations given to her by Our Lord. Her private revelations promoted the establishment of a liturgical feast day and the practice of offering reparation for the outrages committed against the Blessed Sacrament on the First Fridays and the Promises of the Sacred Heart. St. Alphonsus was heavily influenced by St. Margaret Mary in his own devotion to the Sacred Heart. In modern times it was Pope Pius IX who, in 1856, established the Feast of the Sacred Heart and encouraged the efforts of the Apostleship of Prayer-------a confraternity of faithful Catholics who encourage groups, families, and communities to consecrate themselves to the Sacred Heart.. In 1928 Pope Pius XI issued his encyclical Miserentissimus Redemptor on reparation to the Sacred Heart. In 1956 Pope Pius XII published his encyclicalHaurietis aquas on the nature of devotion to the Sacred Heart. First Friday observance that is traditional in many parishes. The devotion of all devotions is love for Jesus Christ. A devout author laments the sight of so many persons who pay attention to various devotions, but neglect devotion to the Sacred Heart. there are are many preachers and confessors who say great things, but speak little of love for Jesus Christ. The love of Jesus Christ ought to be the principal devotion of a Catholic. Lack of devotion to the Sacred Heart is the reason for frequent relapses into serious sin, because people pay scant attention, and are not sufficiently encouraged to acquire the love of Jesus, which is the golden cord which unites and binds the soul to God. . . The Father will love us in the same proportion as we love Jesus Christ. . . We will never be formed in the image of the Lord, nor even desire to be formed in His image, if we do not meditate upon the love which Jesus Christ has shown us. For this purpose it is related in the life of Saint Margaret Mary Alacoque, a nun of the Visitation Order, that our Savior revealed to this servant His wish that the devotion and the Feast of His Sacred Heart should be established and propagated in the Church. In this way, devout believers would, by their adoration and prayer, make reparation for the injuries His Heart constantly receives from ungrateful humanity when He is exposed in the Blessed Sacrament of the altar. It is also related that while this devout nun was praying before the Blessed Sacrament, Jesus Christ showed her His Heart surrounded by thorns, with a cross on the top, and in a throne of flames. "Behold the Heart," she reports that Jesus spoke to her, "that has loved humanity, and has spared nothing for them, even to consuming itself to give them pledges of Its love, but which receives from the majority of people, no other return but ingratitude, and insults toward the Sacrament of Love." The devotion to the Sacred Heart of Jesus, is nothing more than an exercise of love toward our loving Savior. Therefore, the principal object of this devotion, the spiritual object of this devotion, is the love with which the Heart of Jesus is inflamed toward all. Let us now attempt to satisfy the devotion of those who are enamored of Jesus Christ, and who desire to honor him in the Most Holy Sacrament, by a novena of holy meditations and affections to His Sacred Heart. IT was the special desire of our Lord Jesus Christ, revealed to Blessed Margaret Mary, that the first Friday of each month be consecrated to the devotion to and adoration of His most Sacred Heart. In order to better prepare for it, it would be well to read, the evening before, some book treating of this devotion, or of the Passion of Our Lord, and to make a short visit to the Blessed Sacrament. On the day itself we should, on awaking, offer and consecrate ourselves, with all our thoughts, words, and actions, to Jesus, that His Sacred Heart may be thereby honored and glorified. We should visit some church as early as possible; and as we kneel before Jesus, truly present in the tabernacle, let us endeavor to awaken in our soul a deep sorrow at the thought of the innumerable offenses continually heaped upon His most Sacred Heart in this Sacrament of His love; and surely we cannot find this difficult if we have the least degree of love for Jesus. Should we, however, find our love to be cold or lukewarm, let us consider earnestly the many reasons we have for giving our hearts to Jesus. After this we must acknowledge with sorrow the faults of which we have been guilty through our want of respect in presence of the Blessed Sacrament, or through our negligence in visiting and receiving Our Lord in Holy Communion. The Communion of this day should be offered by the adorers of the Sacred Heart with the intention of making some satisfaction for all the ingratitude which Jesus receives in the Most Holy Sacrament, and the same spirit should animate all our actions during the day. As the object of this devotion is to inflame our hearts with an ardent love for Jesus, and to repair thereby, as far as lies in our power, all the outrages which are daily committed against the Most Holy Sacrament of the Altar, it is evident that these exercises are not confined to any particular day. Jesus is equally deserving of our love at all times; and as this most loving Savior is daily and hourly loaded with insults and cruelly treated by His creatures, it is but just that we should strive each day to make an the reparation in our power. Those, therefore, who are prevented from practicing this devotion on the first Friday can do so on any other day during the month. In the same manner they may offer the first Communion of each month for this intention, consecrating the whole day to the honor and glory of the Sacred Heart, and performing in the same spirit all the pious exercises they were unable to accomplish on the first Friday. Moreover, Our Lord suggested another feature in this consoling devotion of the first Friday, by the faithful practice of which he led Blessed Margaret Mary to expect the grace of final perseverance, and that of receiving the Sacraments of the Church before dying, in favor of those who should observe it. This was to make a novena of Communions in honor of the Sacred Heart on the first Friday of the month for nine successive months. But now, repenting and sorrowful, we cast ourselves at Thy feet, and implore forgiveness. Adorable Heart of Jesus, source of true contrition and ever merciful to the penitent sinner, impart to our hearts the spirit of penance, and give to our eyes a fountain of tears, that we may sincerely bewail our sins now and for the rest of our days. Oh, would that we could blot them out, even with our blood! Pardon them, O Lord, in Thy mercy, and pardon and convert to Thee all that have committed irreverences and sacrileges against Thee in the Sacrament of Thy love, and thus give another proof that Thy mercy is above all Thy works. Divine Jesus, with Thee there are mercy and plentiful redemption: deliver us from our sins, accept the sincere desire we now entertain, and our holy resolution, relying on the assistance of Thy grace, henceforth to be faithful to Thee. And in order to repair the sins of ingratitude by which we have grieved Thy most tender and loving Heart, we are resolved in the future ever to love and honor Thee in the most adorable Sacrament of the Altar, where Thou art ever present to hear and grant our petitions, and to be the food and life of our souls. Be Thou, O compassionate Jesus! our Mediator with Thy Heavenly Father, Whom we have so grievously offended; strengthen our weakness, confirm these our resolutions of amendment, and as Thy Sacred Heart is our refuge and our hope when we have sinned, so may It be the strength and support of our repentance, that nothing in life or death may ever again separate us from Thee. Amen.